My author Facebook site is up and running. Why Facebook? Well, this WordPress blog is my main site but, what the hay, let’s do a FB site, too! Check it out if you like. Like the page, too! I wasn’t too sure about including a Facebook page for my writing but some people live on Facebook and thought I should include as much social media as I can handle. If you haven’t already done so, please click the Follow Me banner on the side of this blog – it will let you follow my Twitter account @donalddallan. I love social media. It allows us to reach out and touch/influence so much in today’s world. There are concerns about privacy – and rightly so – be cautious in what you do out there! The trolls are everywhere – not just under bridges. I am getting through my first revision much faster than I expected it would take. And, surprisingly, it is actually fun. I thought I would be slicing and dicing but in reality I am adding content more than I am taking away. I also found a small plot problem so that works. 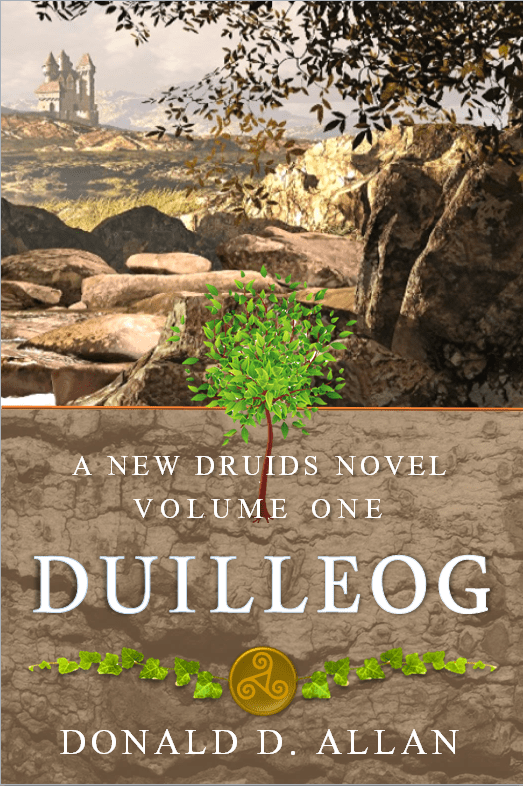 Duilleog (Volume One) looks like it will be around 100,000 words – or about 250 paperback pages. That seems reasonable for a first novel. I have decided, today, to include an excerpt from the second volume in it at the end: As an incentive to buy the second one, don’t you know. All-in-all its positive progress! What I wish is that a free editor-person would fall out the sky and say “I’ll professionally edited your book for freeeeeeee!” That would be something! The fact that I have bothered to actually create a cover for my novel pretty much means that I am getting close to publishing the novel – but, that is a pretty relative statement – I’ve been writing it since October last year. So almost one year of writing…and maybe three to four months more of effort based on my free time these days. To be honest though, the work has been written in bursts of activity and that is the best result of trying to balance real life with writing – it is hard. If I could just prioritise to writing all the time I would have no worries! Anyway, I finished the first draft only about two weeks ago when I realised that I was actually well into writing the second novel. It was a weird kind of discovery. I couldn’t wait to finish my first draft and then I went and wrote right past it! Long story but it can be summarised by saying I didn’t divide the novels up correctly. Too big for one – so I had to split the story into two. But that is boring stuff. What I can tell you is that I have written over 300 pages in the first book. It is comprised of two parts for which the first part has been picked at by me many, many times. So the transition from the first draft to the second draft shouldn’t take much time. For this reason I hope to get the first novel up for sale on Amazon before Christmas 2014. The second volume should be out about six months after that. I can tell you that I have about three more novels in my head for this series. Which surprises me. Also on the back burner, is my first actual attempt at writing a novel. It’s sci-fi and I love the story and can’t wait to finish it. I wrote myself into a corner and found a way out during my vacation in Canada. But the New Druids novels take precedence now. After that comes my first urban fantasy novel. That book has been brewing in the back corners of my mind for several years. That will be a hard write. Its not all flushed out in my head yet. Probably because I read so much urban fantasy these days and I am so much in awe of the tremendous talent out there. Its late and time for bed. Leave comments – be honest – keep watching this space! This is the Kindle version. On a kindle you only need the front cover – not the spine and back cover. So much easier! When doing a full cover you need to determine what the spine width will be and that is calculated based on the number of pages and the type of paper you use. Fun times building the full cover. Tell me what you think about the tree in the middle. I thought it would catch the eye, but it might be cluttering things. Ciao!